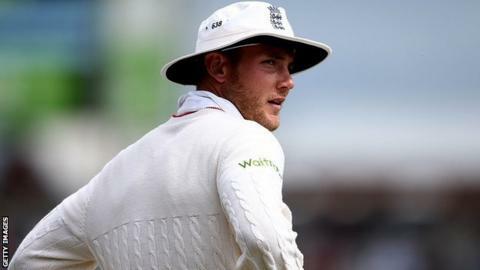 England coach Trevor Bayliss expects fast bowler Stuart Broad to be fit for the first Test against South Africa. Broad, 31, has been struggling with a bruised heel but Bayliss is hopeful he will play for Nottinghamshire in Saturday's One-Day Cup final at Lord's. Bayliss admits he is facing a tough selection process before the series-opener at Lord's next Thursday. And he has not ruled out the prospect of Haseeb Hameed opening the batting alongside Alastair Cook. Hameed, 20, made his England debut in India last year, scoring 219 runs in three Tests before leaving the series with injury. However, he is still without a first-class half-century this season. "I think he's got the attitude that you put him up a level and give him the confidence that we are standing by him and I think he's got the type of game that can come good," Bayliss told BBC Sport. "I'm not going to say one way or the other at this time because my selection in my head might be completely different to what we end up with." Bayliss says there will be "heavy discussion" among the selectors, who meet on Friday, about whether to give Gary Ballance another chance at Test level on the strength of his form for Yorkshire this season. Ballance, 27, was recalled to the Test team for last summer's home series against Pakistan, but made just 24 runs in four innings, then did not play in England's 4-0 defeat in India at the end of the year. However, he is second only to Kumar Sangakkara in the County Championship batting averages with 101.88 having scored three centuries and four half-centuries in 11 innings so far. "It wouldn't be a gamble, he's played at this level before and done well at this level before, and he's probably been the form player of the competition," Bayliss said. The Australian believes the decision may depend on where captain Joe Root bats. He said: "I'd like to see the best player in the team bat at number three. "Three or four, there's not a huge difference in it, although if your best player bats at number three he can set the tone and set things right earlier if we lose an early one or two. "That will be Joe's call. He's the captain, he'll set the batting order." Notts pace bowler Jake Ball has already been ruled out of the Test with a knee injury.